A cupola is a small - or sometimes large - structure on the top of a roof. Cupolas can be nearly any shape including square, rectangular, or dome shaped. They appear on the tops of a wide variety of structures including houses, churches, garden gazebos, barns, or the caboose of a freight train. Vinyl cupola in a square shape with copper roof. From Amazon. Vinyl cupola with a wood roof. From Amazon. 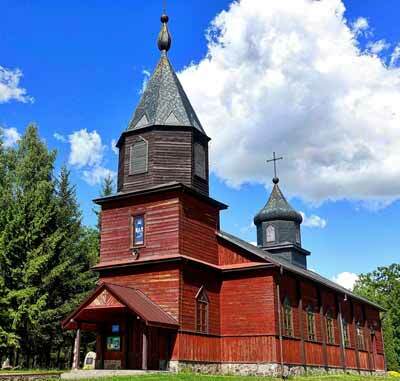 Cupolas can be purely decorative or highly functional: Uses for large cupolas include a look-out vantage point, belfries, or to house a light; smaller cupolas are often useful as a way to exchange light and air. 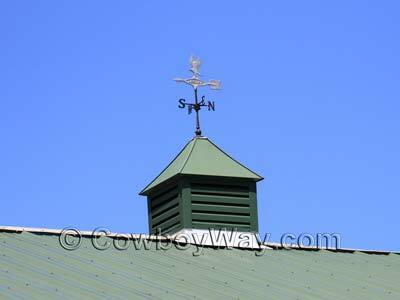 On barns, cupolas are often topped by weathervanes. Below: Two large cupolas on top of a church. 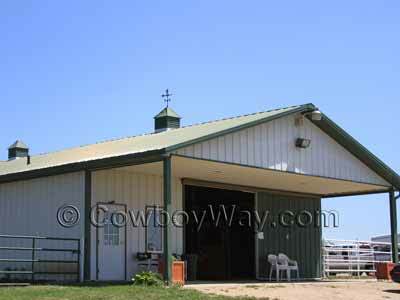 Cupolas are beautiful additions to your home or barn. Contrary to what some people might believe they are often purchased and added to a building after it has been completed, as opposed to being "built in" to the building during initial construction. Below: A cupola on top of a horse barn. This cupola is not only decorative, it acts as a vent to help exchange air. Cupolas have been seen in architecture in the United States since at least the days following the Revolutionary War (1775–1783). As far as our research could find out, the most common speculation is that the American cupola was influenced the the architecture of the Spanish, who in turn were influenced the by Moors, who were probably influenced by cupolas in the Middle East. Regardless of who influenced whom, cupolas have been seen in the United States since at least the 1700s. They are very popular for practical purposes (as air vents, look-out posts, and/or a source of light) as well as for ornate and decorative purposes. The dome-shaped cupola on top of the United States Capital building is perhaps the best-known cupola in the US. Many individual state capitols are also topped by cupolas. Below: Two cupolas, one with a weathervane, on a barn. 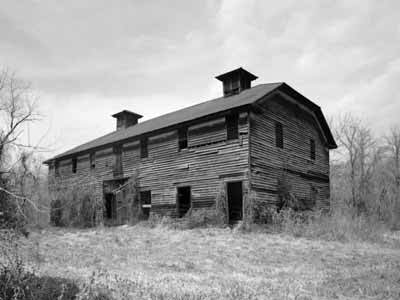 Below: A couple of cupolas on a large, two-story barn. If you find a cupola you like on Amazon but you're not ready to purchase it right away, you can always add it to your shopping cart so it will be easy to find later. In most cases, Amazon will keep track of your cupola, and anything else in your shopping cart, for 90 days. In the meantime, if you want to check out with other items, click "Save for later" to move the cupola to a separate, but still easy-to-find list beneath your shopping cart.